Join the growing number of homeowners across the UK enjoying the beauty, elegance and performance of an aluminium orangery. Working closely with architects, our highly experienced design team are able to provide detailed drawings and specifications for the most complex of projects. Our showroom is based in Cheltenham; however, our services stretch across Worcester, Gloucester and the surrounding areas. The Skyroom cleverly bridges the gap between a conservatory and a high-end orangery and is at the height of innovative contemporary design. The look of an orangery with no imitation features to detract from its good looks and its slimline roof allows you to see MORE SKY – LESS ROOF. The accurate orangery features make the Skyroom the ultimate choice in modern living. Its 300mm high aluminium contemporary fascia gives the Skyroom the realistic appearance of a contemporary ultra slim line orangery lantern both inside and out. 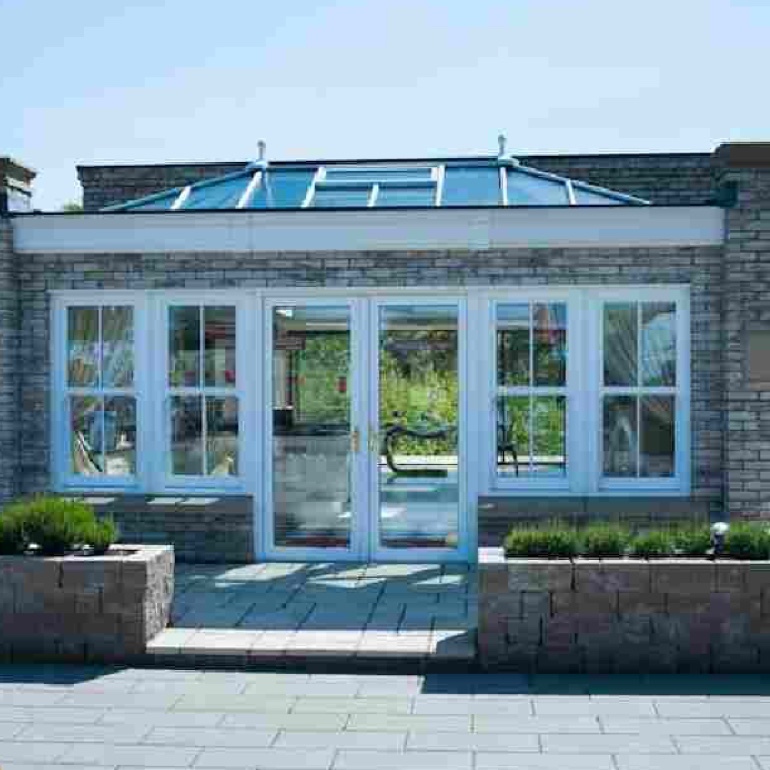 An orangery has a number of features which make it more luxurious than a traditional conservatory. The secret to the Skyroom’s realistic internal appearance is the solid internal pelmet which instantly changes the look of the room, and with spotlights added you can create the perfect evening lighting. Second to this is the appearance of the roof sitting on the pelmet (much like a lantern roof on an orangery). With no unsightly low rod bars or bulky joint covers cluttering the roof, the Skyroom guarantees excellent headroom and no intrusion into the room. Thanks to a Atlas’s signature 70% slimmer ridge and 30% slimmer rafter, the Skyroom blends design aesthetics, outstanding strength and unrivalled thermal performance - all under one orangery style roof. Transform your home and your lifestyle with a stunning SkyRoom or tradiitonal Orangery, expertly installed by the skilled team at Indeluxe. The Skyroom is a unique product and nothing else on the market looks quite like it. - Speak to us today to find out how a bespoke living space can enhance your lifestyle and your home.